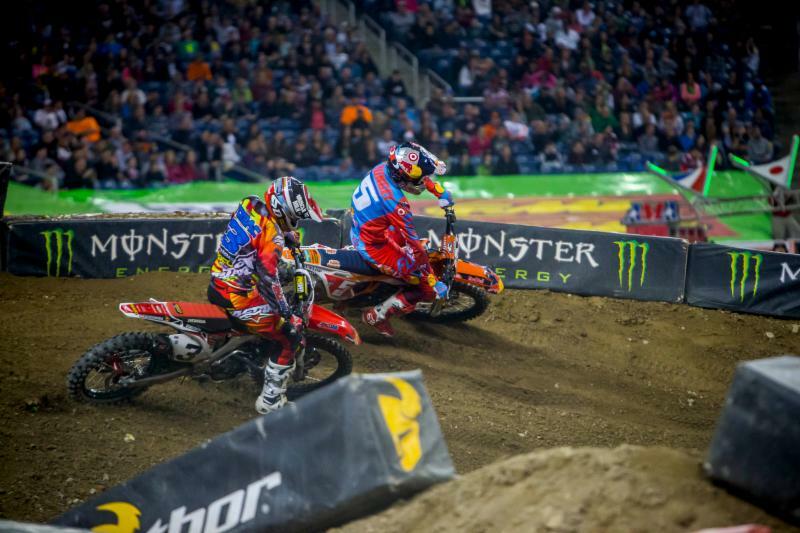 AURORA, Ill. (March 24, 2015) - Following a dominant three-race win streak by Red Bull KTM teammates Ryan Dungey and Marvin Musquin, it was the GEICO Honda duo of Eli Tomac and Justin Bogle who stole the spotlight last weekend in Detroit. GEICO Honda is now the second team in 2015 to sweep both the 450SX Class and 250SX Class Main Events in a single evening. As a result of that distinction, potential rivalries are set to emerge between the top-two riders and teams in the 450SX Class and Eastern Regional 250SX Class standings as St. Louis'' Edward Jones Dome will host the 13th race of the 2015 Monster Energy AMA Supercross, an FIM World Championship, on Saturday night. Saturday night''s race will air live on FOX Sports 1 at 8:00 p.m. EDT/7:00 p.m. CDT/ 5:00 p.m. PDT. Live coverage from St. Louis will also be available on the authenticated FOX Sports Go app. Media Day will take place Thursday, March 26, at 12 Noon CDT at Edward Jones Dome, featuring Monster Energy Kawasaki. •	Will Dungey continue to protect his points lead and settle for another 450SX Class podium, or will he set a career-best mark with his sixth win of the season? •	Dungey''s only win in St. Louis came during his championship-winning rookie 450SX Class season in 2010. Another win in the Gateway City would put the KTM rider one step closer to the second title of his career, and the first for the manufacturer. •	Can Tomac seize the momentum from his win in Detroit and become the second rider to earn back-to-back wins in 2015? It would be the first time Tomac has won consecutive races in his 450SX Class career. •	With the season-ending injury suffered by Trey Canard, who will step up in his absence to fill the soon-to-be vacant spot amongst the top-three in the championship standings? Perhaps it will be his Team Honda HRC rookie teammate Cole Seely, who currently sits fourth and has back-to-back podium finishes to his credit. •	Can veteran Chad Reed get back into the podium mix after finishing fourth last weekend? •	Will up-and-comer Weston Peick break through for the first podium finish of his career? •	Now that Bogle has captured the first win of his title defense, will he continue to cut into Musquin''s points lead? •	Can Musquin bounce back from missing out on the win for just the second time this season to claim his fourth victory and reassert his control in the championship? •	Can Joey Savatgy parlay his second career podium finish into the first victory of 2015 for Monster Energy/Pro Circuit/Kawasaki? •	Will Jeremy Martin ascend to the top of the division? 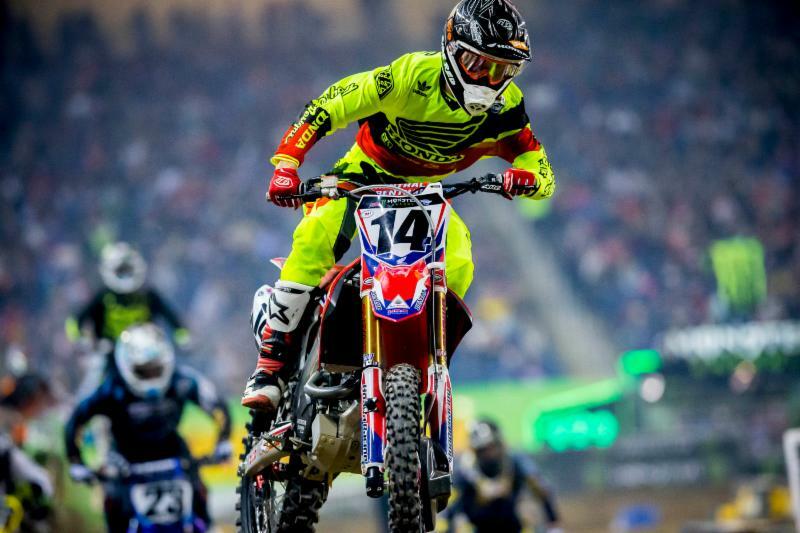 Tomac''s first full season of 450SX Class competition has been filled with the highest of highs and some unfortunate lows. Last Saturday, he was able to take advantage of one of his best starts of the season inside Ford Field to challenge Dungey, methodically work his way into the lead and pull away to capture the second win of his career. Tomac now sits 77 points back on Dungey with five races remaining and is poised to take control of second place in the championship standings with another solid effort in St. Louis. The rider Tomac can overtake is Team Honda HRC''s Canard, who earned no points in Detroit after a crash in the Semi left him out of action with a fractured left arm. The injury will almost certainly remove Canard from contention for the remainder of the season, leaving the battle for the title to come down to Dungey and Tomac. Currently, 67 points separate Dungey from Canard, while 10 points sit between Canard and Tomac. The heartbreak experienced by Dungey''s biggest title threat subsequently means he can strategically approach the remaining races, settling for points and a solid result on a night in which a win may not be necessary. 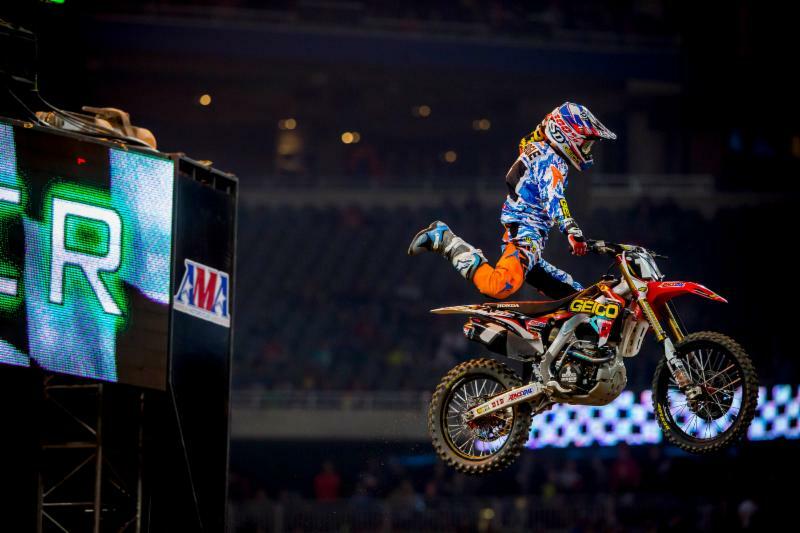 However, St. Louis might provide a little more incentive for Dungey considering the last and only time he collected a 450SX Class win inside Edward Jones Dome was in 2010, when he claimed the title as a rookie. Additionally, Dungey also had a career-high five wins during that 2010 season, a career-best total he has matched coming into St. Louis and would no doubt like to improve upon. Returning to the 450SX Class podium for a second straight week and third time this season, Team HRC Honda''s Cole Seely has been steadily gaining momentum as of late and is now in a position to fill the absence left by Canard. Seely appears to be the rookie to beat at the moment, though he''s only raced inside the Edward Jones Dome once. Nevertheless, the opportunity to finish his rookie season inside the top-three is not something Seely is willing to pass up. After finishing on the 250SX Class podium at every Eastern Regional Championship race leading into last weekend''s stop in Detroit, Bogle broke through for his first win of the season and picked a few highly valuable points off of Musquin''s current lead. Bogle will likely need to keep winning in order to have a chance at defending his Eastern Regional title, but his performance on Saturday night proved he''s up for the task as the end nears. Musquin may not have extended his points lead in Detroit, but he overcame a start outside the top five to finish second and still carries a comfortable 13-point lead on Bogle. With only two races remaining on the Eastern Regional 250SX Class schedule, Musquin has the ability to be strategic in his efforts and protect his points lead, but his dominance so far this season suggests he''ll be gunning for the top spot once again in St. Louis. After a heartbreaking DNF in Indianapolis two races ago, Monster Energy/Pro Circuit/Kawasaki''s Savatgy bounced back from his misfortune to follow Bogle and Musquin onto the podium in Detroit. Savatgy was able to put the past behind him and tie his career-best finish of third, which he achieved at the opening race of the Eastern Regional Championship. The podium result also moved Savatgy up to fourth in the point standings. During last year''s 450SX Class Main Event in St. Louis, Team Yoshimura Suzuki''s James Stewart won his third consecutive Monster Energy Supercross race, which signified the landmark 50th win of his career. Martin Davalos led all 15 laps to win the Eastern Regional 250SX Class Main Event and will hope to do the same in an effort to earn the first win for Rockstar Energy Husqvarna Factory Racing. Tickets are available at the Edward Jones Dome Box Office, all Ticketmaster outlets, by phone (800) 745-3000, or online at www.supercross.com or www.ticketmaster.com. Practice and qualifying begin at 12:30 p.m. and the Main Event starts at 6:30 p.m. Club Seats are $55 Adult/Child; Gold Circle $40 Adult/Child; 400 Lower Level Loge $30 Adult/$10 Child; Upper View Sides $20 Adult/$10 Child; Treadhead $10 Adult/Child. Fans can also get in to the Pits for FREE from 12:30-6 p.m. Race Day when they recycle a MONSTER Energy Can at the stadium''s pit entrance (valid only with event ticket). Headlining the 2015 Monster Energy Supercross television package will be the first-ever live FOX network broadcast from MetLife Stadium in East Rutherford, N.J., on Saturday, April 25 at 3 p.m. E.T. FOX Sports 1 will broadcast 12 races live and FOX Sports 2 will broadcast 3 races live. Each race will include a next-day re-air on FOX Sports 1. In addition, the authenticated FOX Sports Go app will live stream each race. As a precursor to the live television event, don''t forget to catch all of the pre-race coverage with Supercross Race Day Live presented by AMSOIL, which will stream on www.SupercrossLive.com from 12:50 - 4:30 p.m. local race time each Saturday during the season. Practice, qualifying, behind-the-scenes features, and key rider interviews will all be highlighted on the Supercross Race Day Live presented by AMSOIL webcast. For more information on Monster Energy AMA Supercross, an FIM World Championship, please log on to www.SupercrossLive.com, the official website of Monster Energy Supercross. To follow Monster Energy Supercross on Facebook, Twitter and Instagram, log on to www.facebook.com/supercrossLive www.Twitter.com/supercrosslive and www.instagram.com/supercrosslive. Subscribe to our YouTube Channel at http://www.youtube.com/supercrosslive. For all media requests, please contact Denny Hartwig dhartwig@feldinc.com or 630-566-6305. Feld Motor Sports, Inc. is the world leader in specialized arena and stadium-based motor sports entertainment. Feld Motor Sports productions include Monster Jam®, Monster Energy Supercross, AMSOIL Arenacross and Nuclear Cowboyz®. Feld Motor Sports is a division of Feld Entertainment, the world''s largest producer of live family entertainment. Official Monster Truck Series only at Monster Jam. For more information on Feld Entertainment, visit www.feldentertainment.com.